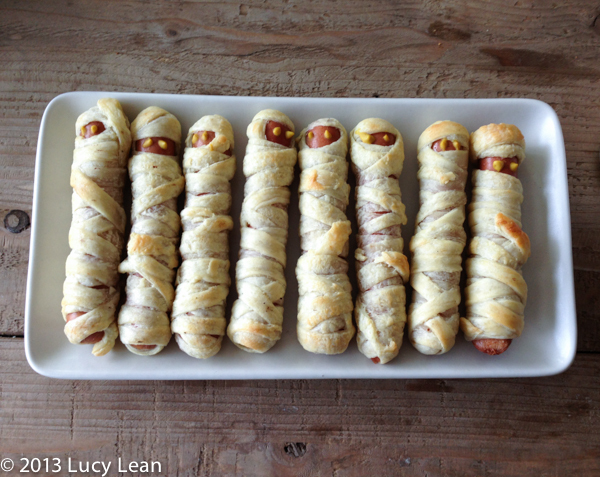 Aren’t these just the most perfect food for any Halloween celebration – or for that matter an Egyptian mummy project – or just because? The idea is nothing new – and there are plenty of versions to be found around the web – but mine were inspired by the living legend of food bloggers: Ree Drummond, AKA The Pioneer Woman and her fabulous new book – The Pioneer Woman Cooks: A Year of Holidays: 140 Step-by-Step Recipes for Simple, Scrumptious Celebrations . I flicked through the easy to follow pictures and marvelled at all the great ranch shots – think cowboys, cattle, horses and home on the range – which is obviously where Ree calls home. Her book is divided into 12 holidays – from New Year’s Day to New Year’s Eve with everything in between. 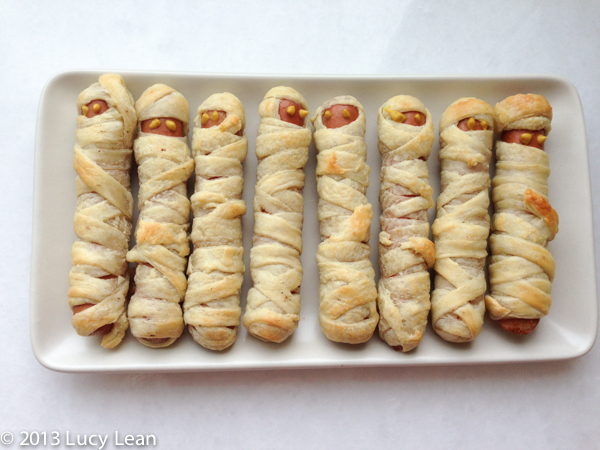 It being the week of Halloween I turned to this chapter for inspiration and immediately fell in love with the mummy dogs. 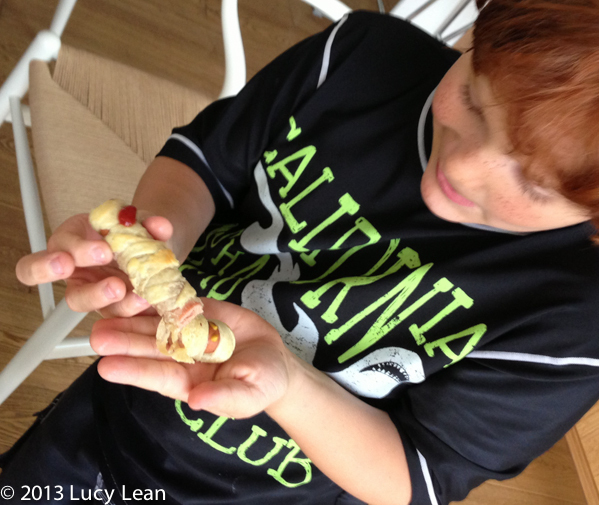 Ree uses her basic dough recipe to wrap her dogs – for mine I used frozen puff pastry. 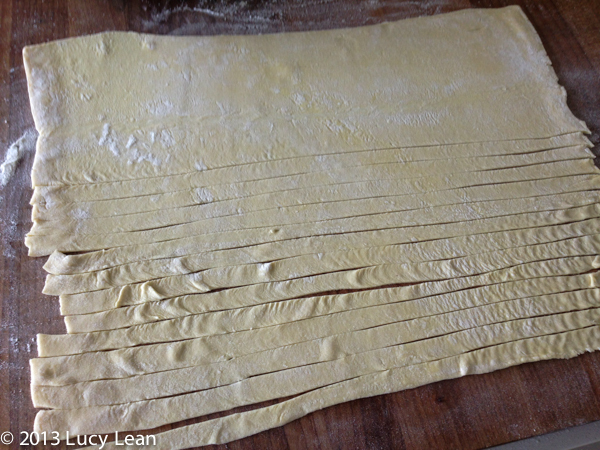 Basic dough, puff pastry, pizza dough or store bought biscuit dough. 1. Pre-heat the oven to 350 F. On a lightly floured surface roll out the dough and then cut into thin strips using a sharp knife or a pizza cutter. 2. 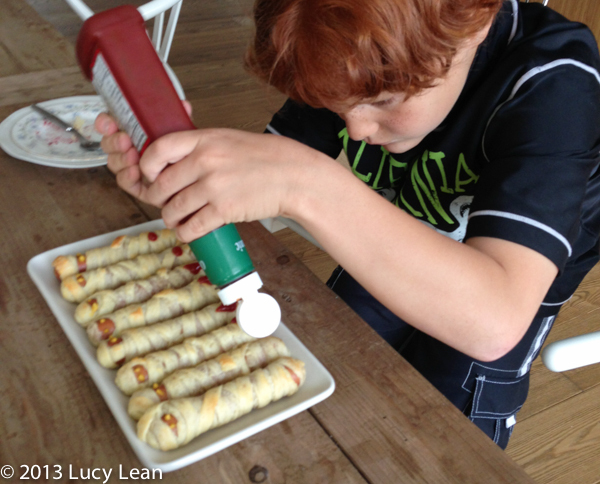 Take one strip of dough and start by placing it over the top of the ‘head’ of the frankfurter – going up and over before you start wrapping around, criss-crossing as you go. Leave a gap for the face. I used two strips per dog. Use a little water to stick the ends down. 3. 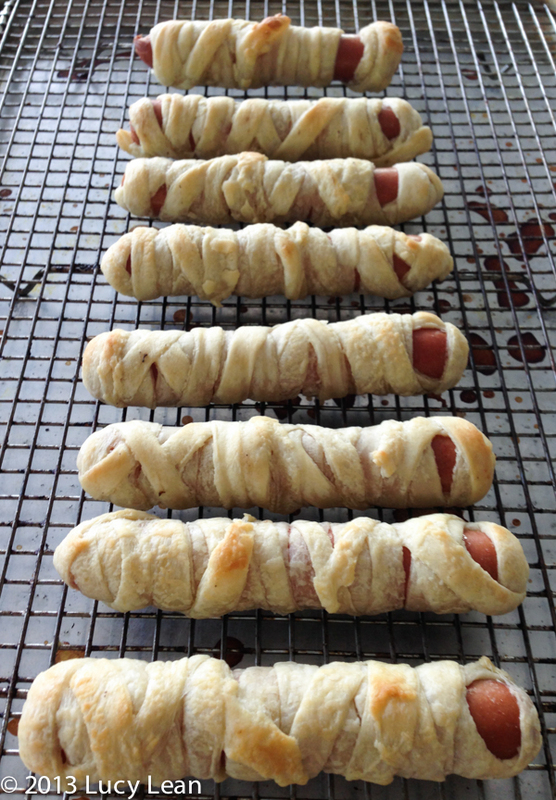 Wrap all the dogs and line up on a baking wrack. 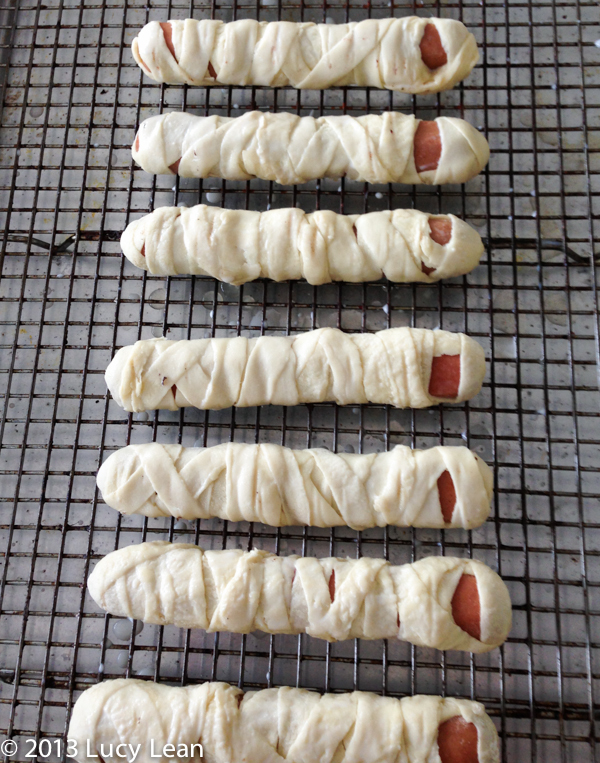 Use a little milk or egg to lightly brush the mummies. 4. Bake in the oven for 15 – 20 minutes, until golden brown. Let cool for 5 minutes before transferring to a plate. 5. 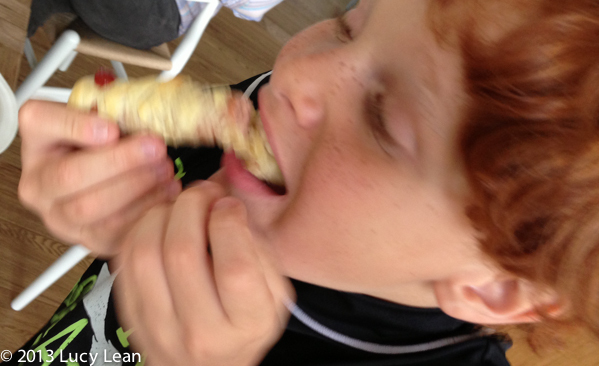 Dot two little mustard eyes – either use the nozzle on the mustard bottle or a tooth pick. 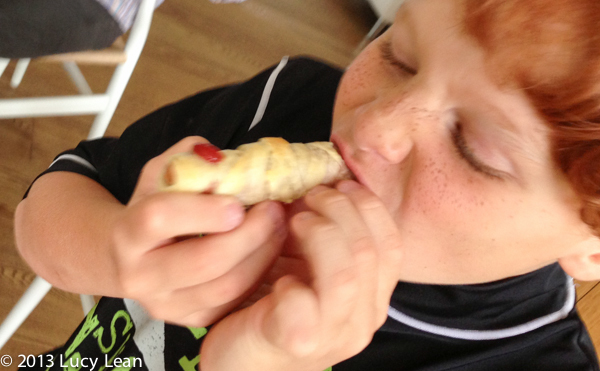 If you have anyone like Rémy in the house they will be unable to wait for the mummies to cool down – here he is decorating the mummies with ketchup – “for blood Mummy!” Then he bites into a piping hot mummy only to spit out the head because it was too hot! Decapitated Mummy – perfect for Halloween! Thank you for the inspiration Ree. The Pioneer Woman Cooks: A Year of Holidays: 140 Step-by-Step Recipes for Simple, Scrumptious Celebrations .